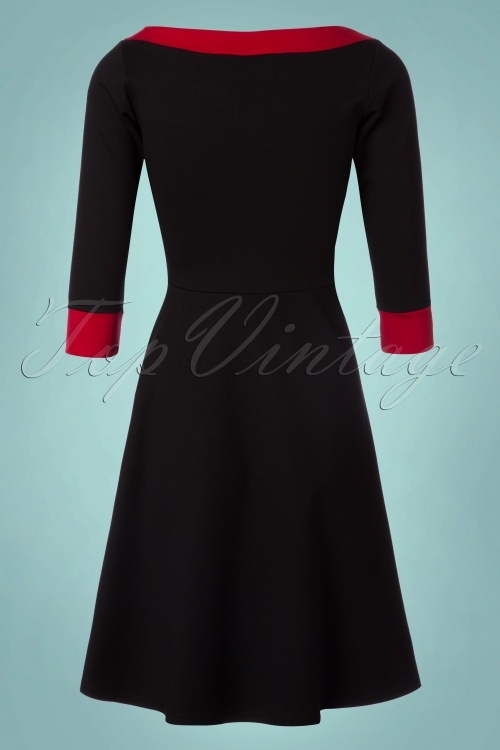 Sophisticated and cute with a sailor touch, that's this 50s Dreamboat Dollie Swing Dress in Black! 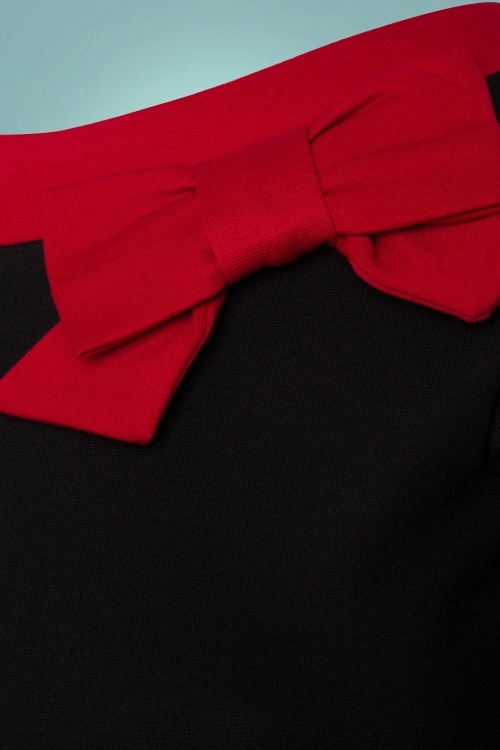 Black and red, are daring and striking colour combination... do you dare to wear it? This semi-swing dress features a beautiful fitted top with a round neckline, elegant 3/4 sleeves and runs into a gorgeous flowy skirt from the waist down. 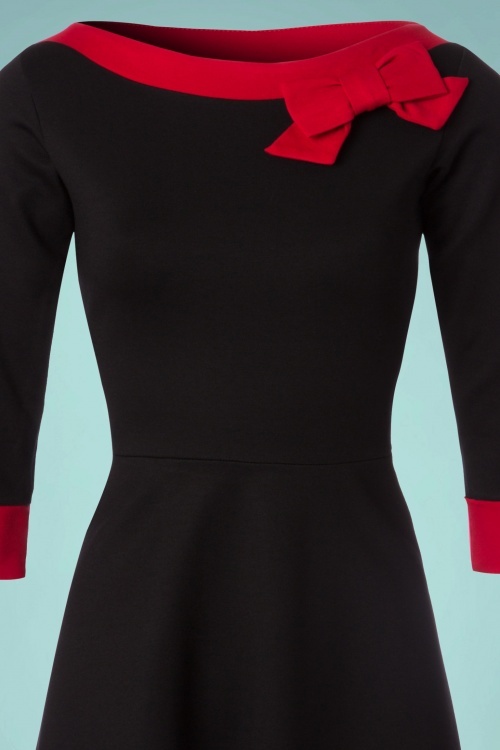 The cuffs, the neckline and the fixed flat bow detail at the neckline come in a contrasting lipstick red colour. 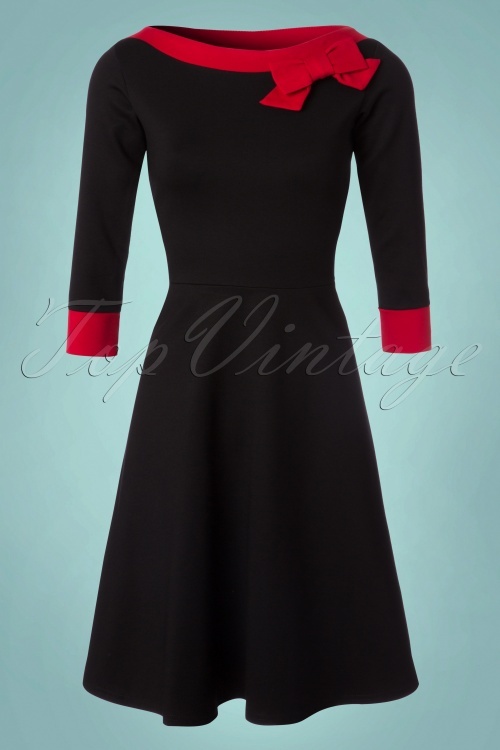 Made from a supple black fabric with a light stretch which is a joy to wear. Dollie is the perfect dress for every single occasion; work, a night out, or casual ánd you can easily wear her throughout all seasons! Divine darling Dollie, you're a complete dreamboat! Mooie dikkere stof waardoor het jurkje ook mooi valt. De pasvorm is ook heel goed. Mooie dikke stof, valt goed en kleedt goed af, ziet er erg chique uit! Gestern bestellt. Heute schon da. Sieht super aus, bin gleich zur Schneiderin wegen der Länge. Daß ich so ein Glück habe mit einem bestellten Kleid......ich kann es kaum glauben! Es passt perfekt, nur ein wenig kürzen muß ich es. Das ist leider bei meiner Größe von 158 cm ganz normal. Die Kleider passen wie angegossen und haben genau die richtige Länge bei einer Körpergröße von 1,71m. Die Pullover sind herrlich anschmiegsam und passen perfekt. Wie immer eine super schnelle Lieferung. Der mit Abstand beste Onlineshop, den ich kenne!